Krakow is the most popular, culturally rich city in Poland. With over 760,000 inhabitants, it is the second largest city in the country. Krakow is the ultimate chance to explore one of Europe’s ancient cities and enjoy some authentic Polish cuisine. Famous tourist attractions include Historic Old Town, Wawel Royal Castle and Wieliczka Salt Mine. Cheap flights to Krakow are now available for a limited period of time, so get ready to tour this historic city! Krakow is home of John Paul II International Airport Kraków–Balice (KRK), which is located on a 30-minute drive from the city centre. Forget just your three main meals, the Polish enjoy second breakfast and proper tea-time snacks too! Make sure to also try the deliciously famous dumpling-styled dish called “pierogi”. Old medieval-styled churches and little streets that seem to transport you to another era – take the scenic route and visit all of Krakow’s most famous sites on foot. Krakow holds onto some of Europe’s most significant history. Let the locals tell you their stories on tours around the Old Town in the city. Krakow has four distinct seasons and each of them bring a beauty to the city that is worthy of an experience. That said, the most ideal time to visit Krakow would be over the spring and fall. During this time, the temperature stays around 20 degrees Celsius, and the days are perfectly suited to sightseeing and admiring the beautiful medieval structures. Summer in Krakow (July – early September) is peak tourist season and can get very hot and humid. Unfortunately, it gets very expensive and flights and accommodation become very pricey. Winter, though icy, is splendid if you’re keen to try out skiing. The Tatra Mountains on the edge of Krakow are fully snow-capped – turning your vacation a wintery wonderland. If you were to ignore the very fashionable and modern youngsters in Krakow, you would think that you had taken a step back in time. Krakow is one of the few European cities that still holds all of its old charm, while it welcomes in the new with gracious ease. Cathedrals, cobblestone lanes and the Krakow hourly trumpet from St. Mary’s church are all part of the Polish appeal in this city. And what would a city be without its food? In this department you will be pleasantly surprised to find that Polish food is most definitely for everybody. 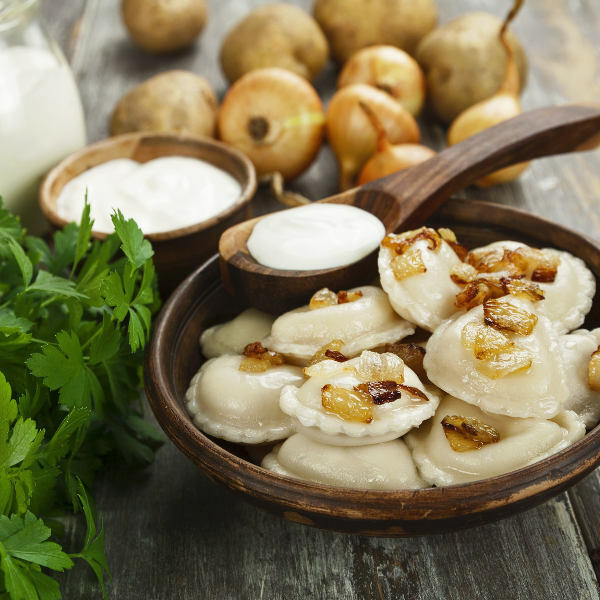 Plenty of starchy foods like the famous “pierogie” get paired up with spicy meaty favourites like “zrazy”. Simply divine! Of course, after all that food we recommend that you take the scenic walk up Krakus Mound for breathtaking views of the city and a great way to stretch your legs. Compare several airlines, and book your cheap flights to Krakow online at Travelstart. Krakow is a safe city with constant praise from past visitors on this topic. It is safe to travel to on your own, and also to walk around in the evening as the city is very busy after dark. It is always important to have your vaccines up to date when you are travelling. When visiting Krakow, it is recommended to get a vaccination for hepatitis A if you think you’ll be eating any exotic food. It is also a good idea to get a shot for hepatitis B, and then Rabies if you plan to spend some time doing adventurous activities too.